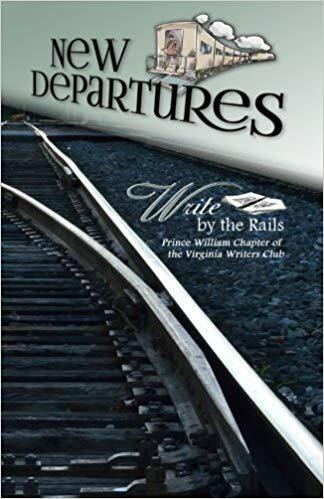 Write by the Rails (WbtR) is the Prince William Chapter of the Virginia Writers Club, a 501(c)(3) non-profit. We aim to raise the profile of the local literary community and explore ways we can nurture, cultivate and help that community grow. We strive to be an integral part of the larger arts community and to enhance the quality of life for residents of the area by providing them with the opportunity to participate in events and activities that promote writing, literacy and self-expression. If you are a writer (published or unpublished) affiliated with Manassas, Manassas Park or Prince William County, consider officially joining. Join Write by the Rails and enjoy monthly enrichment activities and a variety of events designed to help you grow. We meet regularly at local venues that support the literary community and the arts. We maintain an events calendar. We also announce monthly meetings in our newsletters and our membership Facebook group. We maintain a public Facebook page that anyone can follow. We've all been there, alone in a room, staring at a blank screen or scribbling notes that make us wonder why we bother trying to write anything. Writing can be an isolating, frustrating experience. You need a community of cheerleaders, educators, experienced professionals and colleagues. That's where Write by the Rails (WbtR) comes in. WbtR is passionate about the process of creating and propagating the written word, and encourages others to share in this fascination. WbtR, its officers, and members act in concert to meet common goals. WbtR’s credibility rests on a foundation of personal and professional ethical standards. We are grateful for the support the local business and nonprofit communities have given us. We strive to be good guests by making purchases during meetings and leaving the premises the way we found them. WbtR cultivates an atmosphere of mutual respect for individuals and organizations both internal and external to our organization. WbtR is an inclusive organization that welcomes members without discrimination of age, race, gender, sexual orientation, religion, national origin, or disability. The organization accepts, recognizes, and fosters a diversity of intellectual and artistic written expression. Note, certain venues and publications do require written and spoken material to be at a "PG-13" rating. Writing is largely about audience, so please consider that before sharing graphic work. Our goal is to help connect you with other writers, and along the way, meet our mission of raising the profile of our talented, local literary community. We've done it, too, since 2011. The area's longest-running literary group with a statewide affiliation, Write by the Rails is the Prince William area chapter of the nonprofit Virginia Writers Club which celebrated 100 years in 2018. Since its inception, WbtR has held regular meet and greets and workshops, spearheaded programs for adults and youth, produced anthologies, kicked off the local Poet Laureate program, inspired readings and events and networked with other local groups. Prince William County, Manassas and Manassas Park have become central to the Northern Virginia literary scene, and WbtR is proud to be a part of that. An anthology, New Departures reflects the diverse ideas and creative work of Write by Rails's membership. In this first WbtR publication, members offer poetry, fiction, nonfiction and even a merge of genres. 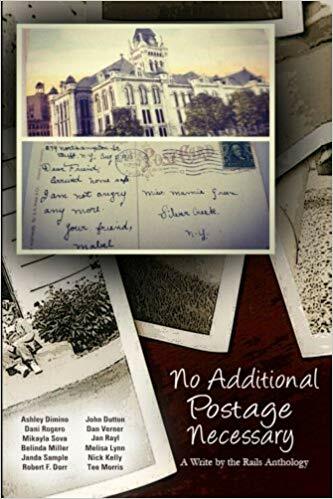 The product of Write by the Rails's first Rising Writers Workshop for young adults, No Additional Postage Necessary inspires, surprises, amuses and raises some eyebrows, too. 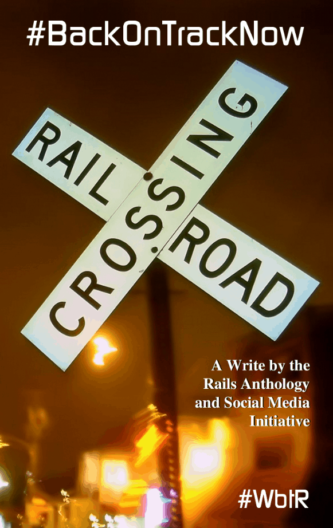 In this unique anthology, Write by the Rails showcases Twitter-friendly writings by 22 members and friends who took part in a three-month social media campaign. #BackOnTrackNow serves as a reflection of the times and an effort to change the discourse of social media.